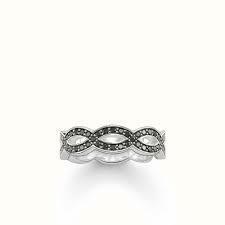 This Thomas Sabo Silver and Black Knot Ring Size 56 features Cubic Zirconia stones embellished into the ring detailing. The design of the ring is in a twisted knot style, all of the way around the band. The perfect gift for a loved one.